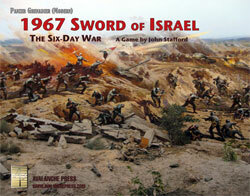 Our first Panzer Grenadier (Modern) game, 1967: Sword of Israel, is a huge affair covering all three fronts of the Six-Day War: Sinai, the West Bank and the Golan Heights. There are fifty scenarios, taking each front in turn, and today we’ll finish looking at those set in Sinai. You can read Part One of this survey here, and Part Two here. By the time Marshal ‘Amr recovered from his breakdown and began trying to bring order to the chaos he had induced in the Sinai Field Army, most of his large units had already disintegrated. The marshal ordered what few intact units he had left to fight rearguard actions against the rampaging Israeli armor to allow his shattered divisions to recover. Obedient to their orders, an Egyptian mechanized battalion set up in front of Bir el-Hamma to await the Israeli Tank Battalion 82. The Israeli commanders wanted to make up time rather than get bogged down in a prolonged fight. So the Centurions and infantry ran straight through the Egyptian gauntlet firing as they went. Once through the line, they realized the hill in the rear was a mass of fortified pillboxes which the infantry and a company of tanks assaulted while the rest of the Centurions mopped up the Egyptian line. The defense was resolute and it was not until 1200 that the Israeli force could move on. This isn’t a very large scenario by the standards of this game, which means the Israelis have “only” a dozen Centurion platoons plus supporting infantry to bash their way through a tank-supported Egyptian defensive line. The bar for an Israeli victory is raised pretty high, which is a lucky thing for the Egyptians. Tat Aluf (General Tal), as his next objective, intended for his Ugdah (84th Armored Division) to block the escape of the Egyptian 4th Tank Division from its large camp at Bir Gifgafa. The Israelis quickly threw a blocking force across the western road leading toward Ismailia, but the trap became complicated by the slow movement of a large part of the Israeli armored force from the south out of the Wadi Ml’ez and heading northwest to intercept the Ismailia road west of Bir Gifgafa. The slow accumulation of forces further challenged the Israelis as they needed a sufficiently strong force to attack. Together, this allowed the Egyptians to begin slipping away. The Israelis tried valiantly to catch the fast-moving Egyptians. Two times a large Egyptian tank force swung out to face off with the Israelis, allowing the rest of the force to try to get away. In the end, the Egyptians were able to hold off the bulk of the Israelis until night fell and the force effected its escape. The Egyptians need to run across the board and escape, but they come into play in separate waves and that’s going to slow their progress. Meanwhile waves of Israelis are coming in from the flank to disrupt them. It’s an odd scenario, but one filled with maneuver. The Egyptians have the numbers to put the hurt on the individually-superior Israelis if the Sons of David are careless. In the wee hours of the 8th of June, the Egyptians assembled a large force to break out from the camp and through the Israeli roadblock to the west. They had to get across the Suez Canal. Egyptian T-55s had infrared sights as well which would give them an edge, as would the fact that the AMX-13’s 75mm gun had difficulty penetrating the front of a T-55 except at point blank range. The Egyptian attack enjoyed initial success as the Israelis lost their mortars and significant ammunition in a series of catastrophic explosions. However, the Israelis rallied, firing self-propelled divisional artillery into the attack, and hitting the flank with a company of Super Shermans. In addition, the Egyptians did not fully leverage their night sights while the Israelis used illumination rounds from mortars and artillery to good effect. The low pass of a flight of Vautour bombers completely unnerved the Egyptians who retreated and eventually snuck past the Israeli blocking position under cover of darkness. The Israelis enjoyed a hollow victory. This time the Israelis are already in place across the Egyptian retreat path, but the Egyptians have better tanks and slightly more of them as they try to bop their way past. They can’t get there without taking on the Israeli tanks head-on, so there’s going to be a great deal of tank combat in this one. At mid-morning the disorganized rear elements of the 6th Egyptian Mechanized Division ran headlong into the recently set up Israeli blocking position across the road at Nakhle. As the front of the Egyptian column recoiled, additional Israeli tanks drove into the flank of the column followed by infantry in their halftracks. The Egyptians were in a terrible mess. It took until 1700 to finish the fight, but the Egyptians did not have much heart in this battle. The majority of the foot troops ran off into the desert, while IAF aircraft stalked the vehicles that slipped by the roadblock. Huge amounts of undamaged materiel fell into the hands of Israel that eventually helped equip their forces after the war. On a long and narrow battlefield, a massive force of unhappy Egyptians must fight their way past a pretty strong Israeli armored group. Once again we’re going to see close-ranged tank fighting. At dawn, the Israeli Granit Force jumped off from Romani headed west toward Kantara and the Suez Canal 40 kilometers away. At a narrow causeway across a salt marsh they encountered an Egyptian blocking force. Trading shots with the Egyptians did not seem to promise victory so the Israeli jeeps with recoilless rifles began maneuvering through the marshy ground to turn the flanks. The T-55s tried to react by also moving into marshy terrain but several became mired and had to be abandoned. Eventually, threatened with being surrounded, the blocking force pulled out. This time the Israelis are on the attack, with a recon force built around fast jeeps (with potent recoilless rifles) and light tanks against some pretty good Egyptian armored infantry with a smattering of tank support. This one’s going to be tough on the Israelis. As Granit Force drove within 20 kilometers of Kantara they encountered a second roadblock. What few elements of the Sinai Field Army that still possessed a semblance of unit cohesion had been ordered to delay the Israelis long enough for reserves held back to protect the Suez Canal to deploy. Fortunately for the Israelis of Grant Force, they’d also been joined by Aluf Mishne Eitan and some of his paratroopers and Patton tanks, since this would be a harder nut to crack. Initially Eitan sent the Patton tanks right down the road through the Egyptian roadblock, firing as they went. Once the tanks passed through, the Egyptians blocked the road and began fighting in both directions, including using a new weapon against the Pattons, the AT-1 “Snapper” antitank guided missile. Aluf Mishne Eitan was shot in the face early on which caused the paratroopers’ attack to completely falter. It was not until the IAF had worked over the Egyptians for over two hours that the ground assault again made any headway. The road was finally clear but supplies had run short and moving on would be a challenge. The Israelis are on the attack again, with strong forces including paratroopers with their stratospheric morale. The Egyptians hold a strong position, but it’s hard to hold anything in the face of attackers this potent. Late in the morning lead elements of the Israeli 7th Armored Brigade encountered a reinforced battalion of cannily dug-in T-55s from the Egyptian 4th Tank Division. The Israelis needed to push through the pass rapidly to catch the rest of the fleeing enemy division, but the task would be tough across this sea of undulating sand. The T-55’s, tucked carefully between the sand ridges with only their barrels and tops of their turrets visible, proved quite a challenge for the advancing Israelis that could only be overcome with a frontal assault. While the more heavily-armored Centurions led the charge, the lighter Pattons swept wide to the east and west to take the T-55s in the flank and rear. In addition, the merciless pounding by IAF aircraft eventually destroyed the Egyptian force that bravely died in place. And we finish up the Sinai selection with a pure armored fight: Egyptian T-55’s with crack crews dug in and waiting for even cracker Israeli Centurions and Pattons. This is treadhead wargaming in its pure form. And that wraps Part Three. There’s more to come – Jordanian and Syrian action is in there, too!